Devin is judging the 2016 Wakagoi Show! Devin has been invited to judge the 33rd All-Japan Young Koi Show that is to be held in Kure on March 26 – 27,2016. This is a tremendous honor and we are very proud of Devin’s achievement in Koi. 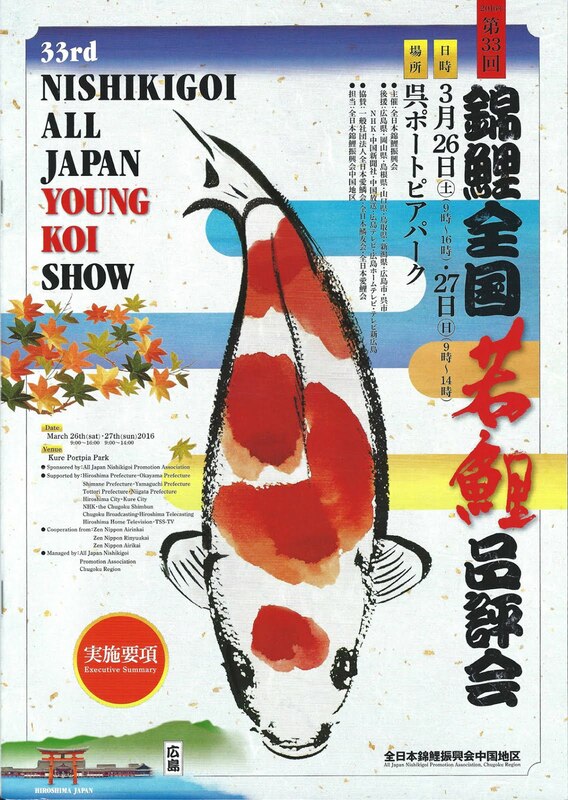 The All-Japan Young Koi Show is also known as the Wakagoi Show. Wakai literally means “young” in Japanese, so Wakai + Koi = Wakagoi; however, since there can be no real definitive verification of Koi age once they are entered, the restrictions lie in the maximum size allowed. Only Koi 63 cm and under are permitted to compete. This show is a travelling show that is moved every two years. This is Devin’s first time to judge the Wakagoi Koi Show and his second time to judge a Japanese National Koi Show. The first time was in 2013 when he was invited to judge the All-Japan Shinkokai Koi Show.